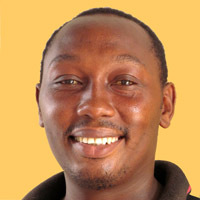 Nangida Massawe was born in 1976 and his tribe is Chagga from Kilimanjaro Region, Tanzania. His grandfather who was inspiration for Nangida had some artistic inclinations. He started schooling in 1984 in Primary level, 1991 he joined secondary education. After finished his A level studies in 1998 at Msufini secondary school. Nangida began to paint when he was a little boy of 5 to 6 years. When he was in primary school he was told by his teacher to paint birthday card and teaching aids for his teachers. Then after finishing his A level Education he joined Bagamoyo College of Arts pursuing Diploma in Art. In 2000 he was a student of Peter Martin who taught him to paint Tinga Tinga style at Village Museum in Dar es Salaam, until now he is working at Village Museum. In this regard Nangida is a kind of dinosaur as he endured to work there the longest time until now. Now the studio is occupied only by Nangida. But once upon a time there were working painters such as John Kilaka, Emmanuel Jeremiah and their teacher Peter Martin (whose teacher was Damian Msagula). This small group of painters, their friendship and work stretches beyond tribal differences. Five painters, five tribes – Chagga, Mfipa, Makonde, Mlundi and Myao. Nangida paints Tinga Tinga and Morden art – mostly Masai people (See the gallery). His Tinga Tinga style is different from the mainstream Tinga Tinga. He depicts village life and animal in very decorative way. It is popular among children and it is not coincidence that he started recently to add African tales to his paintings. His dream is to illustrate a children book. His teacher Peter Martin died while illustrating a children book for a Japanese publisher. Nangida had an exhibition in 2001 at National History Museum in Arusha and 2003 at New Millenium Towers in Dar es salaam. Also in 2002 he attended workshop at German Boma in Bagamoyo to learn how to make natural colours.